Many of you have been reading my blog posts for awhile. Some of you may have stumbled on my blog from anther blog, or Facebook or BlogHer, or The Next Family. If you are a repeat viewer, thank you! For those of you who are new to my blog, you need to know that I live with three boys. Three teenaged boys. Three smelly teenaged boys! I mean I love my boys, but have any of you all ever hung out with teenaged boys for any length of time? They have their own specific scent. Some people have their own names for this scent. I call it “Boy Funk”. They just smell funky…. Truly, I thought I was doomed to spend eternity (or at least until they graduate and move out) living with Boy Funk. Then an amazing thing happened! I went to the grocery store and needed a new bottle of fabric softener. My favorite is original Downy in the blue bottle, so into my cart it went. Attached to the neck of the bottle was a little bag of a new product called Downy Unstopables.I had never seen this product before and was intrigued. It wasn’t laundry day, so I put it aside until Saturday when the boys wash their clothes. I taught my boys how to wash their clothes when they were 14 and they know that Saturday is their day to wash. 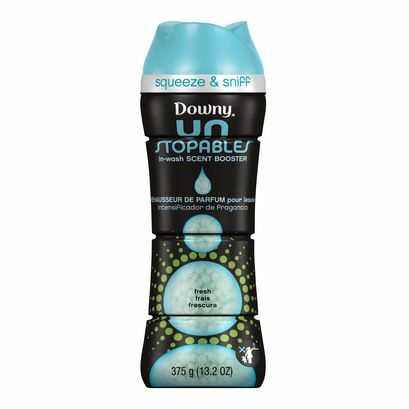 The Downy Unstopables are not a fabric softener, they are an in wash scent booster. They go directly into the washer and are safe for all colors and fabrics. When Saturday came around and it was time for the boys to wash their clothes I had a brilliant idea. I “hung out” with them when they were washing their clothes, and slipped some Downy Unstopables into the washer when they walked out of the laundry room. WOW! What a difference! I was actually able to be around them more! I mean, their clothes always smelled good after being washed because we use Downy Fabric Softener. But when those Unstopables were added to the washer it made the fresh scent last SO much longer. You have to understand how amazing this is! My boys don’t use drawers or a closet for their clothes. Their clean clothes usually end up strewn around their rooms. On dressers, chairs, the floor, pretty much any surface can have clothes on it. Their clothes smelled fresh even after they had been on the floor! THAT is amazing to me! Since that free little bag of Downy Unstopables entered my house, this product has become a staple, and is used by all of us! Both the Wash Fresh Scent and the Wash Lush scent smell awesome! This is a product that I think would be great in any household, whether you have stinky boys or not! It is definitely wonderful to take clothes out of drawers or off hangers and have them smell as fresh as if they had just been washed! From now on it is Downy Unstopables for my house! You can buy this amazing product at any store, but you can also buy it online at the Proctor and Gamble e-Store. In fact, if you purchase this and other wonderful P&G products such as CoverGirl, Olay, Old Spice deodorants and body wash (a favorite in my house), Pampers, and even Iams pet food the P&G e-Store is offering some great deals for you! Those are amazing deals! Definitely check them out at the P&G e-Store! So funny. I am glad you found the answer. Thanks Madge! They are a stinky lot, but I love them all dearly!